NEW DELHI — Indian Prime Minister Narendra Modi came to power in 2014 promising big-ticket economic reforms. But with unemployment rising and signature policies getting panned, Modi’s Bharatiya Janata Party has adopted a nationalist pitch ahead of a general election that begins this week. The last time the BJP sought a second term was 2004, when it spent millions on an ad blitz projecting India as an economic powerhouse. The voters didn’t buy it. Election results showed that people voted according to their caste, an ancient hierarchy in India that is outlawed by the constitution but still vital in Indian politics. A November 2016 demonetization program aimed to curb black market money by taking some rupee notes out of circulation. But it ultimately hurt the poor, and India’s central bank said later that most of the illicit funds had re-entered the banking system. According to the Centre for Monitoring the Indian Economy, employment contracted in the year following demonetization by 3.5 million jobs. The think tank said unemployment reached 7.4% in December 2018, its highest rate in more than two years. Public subsidies to farmers have failed to steady India’s agricultural sector. Amid growing scrutiny of Modi’s economic record, a suicide attack in Kashmir killed 40 Indian paramilitary soldiers in February, helping the BJP hone its nationalist pitch. Analysts say Indian airstrikes inside Pakistan in response to the attack gave Modi a pre-election boost. BJP leaders quickly made national security a central plank of their campaign. In northern parts of the country bordering Pakistan, anti-Pakistan sentiment has always been strong because of the bloodshed during the countries’ partition in 1947 and three wars since then. The BJP is mainly supported by upper-caste Hindus, while struggling to make headway with lower-caste voters and non-Hindus. Successive governments have sought to redress discrimination against those on the lower rungs by setting up quotas for government jobs and university spots. Currently, just under half of all government jobs and places in state-funded schools are allocated to the lower castes. 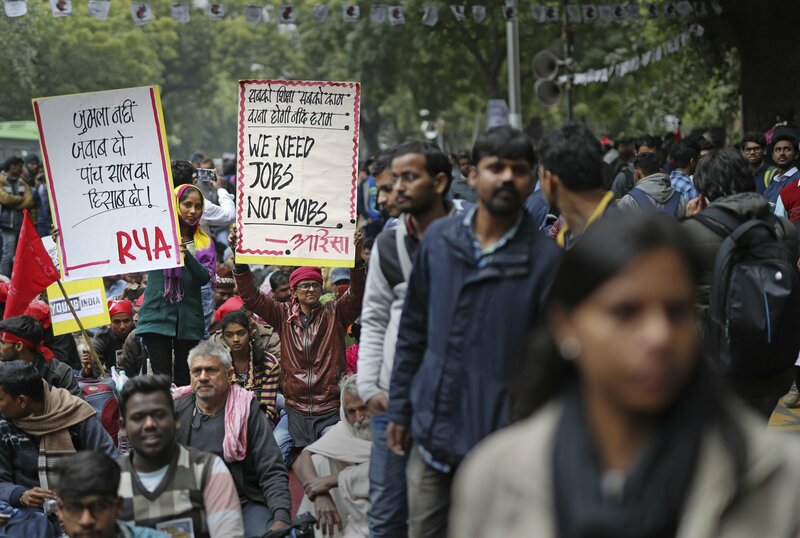 With an eye toward elections, Modi’s government last year passed a law carving out 10% quotas for lower-income Indians belonging to higher castes. Modi has been on an electoral blitzkrieg across this vast country, promoting government development projects while blasting the alleged corruption within the opposition Congress party, a dynasty that began with India’s first prime minister, Jawaharlal Nehru. Nehru, his daughter Indira Gandhi and her son Rajiv Gandhi ruled the country for about a half a century after India won independence from Britain in 1947. Rajiv Gandhi’s son, Rahul Gandhi, is now the Congress party leader and a potential candidate for prime minister if the opposition can stitch an alliance to stop the Modi juggernaut. That’s easier said than done. Despite Congress victories in three key state elections in December, bucking a string of losses to the BJP since 2014, Gandhi has struggled to marshal widespread support for his beleaguered party, even after bringing his popular sister, Priyanka Gandhi, into the fold. The Gandhis would have to unite the opposition in order to take on BJP candidates in the vote-rich states of Uttar Pradesh, West Bengal and Delhi. A split in opposition votes would likely benefit the BJP. Giveaways are essential in Indian politics. Some 270 million people — roughly 22% of the country’s population — live in poverty, making giveaways particularly attractive to voters. In the past, farmworkers were offered cows and goats. In its interim budget in January, the Modi-led government announced that farmers would be paid 6,000 rupees ($85) annually, benefiting as many as 120 million households. The Congress party waived farmers’ bank loans in the three states it won in December. It promised in its election manifesto to waive outstanding farmer loans elsewhere, and to decriminalize farmer loan defaults. A ladder, hand pump, bicycle, bow and arrow, bungalow, book, mango and banana are just some of the many objects voters will see on their electronic ballots, symbols of the dozens of political parties and independent candidates in the fray. Since only about a fifth of India’s population could read or write at the time of the country’s first election in 1951, the symbols were introduced on ballot papers to help the unlettered cast their votes. Nearly three-quarters of Indians can now read, but the icons remain evocative political symbols. Among the best-known symbols are the lotus flower for the governing BJP, and the outstretched palm-facing hand for Congress. The Aam Aadmi Party, or the Common Man’s Party, which rules the state of Delhi, chose a broom as its election symbol, reflecting its pledge to sweep the political system clean of corruption.